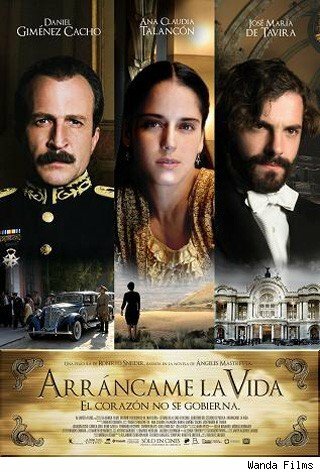 Mil gracias, truly a thousand thanks, to Cine Las Américas and the Consulate General of Mexico for the presentation of the Mexican movie Arráncame La Vida (Tear This Heart Out). Directed by Roberto Sneider and based on the highly acclaimed novel by Ángeles Mastretta, the movie was a phenomenal cultural treasure that honored Austin a few weeks ago. It is without a doubt our public role to invite, host, share, and support such international cultural gifts, and this unique jewel enriched Austin in return. I attended the special screening event with award-winning author Ángeles Mastretta in attendance at the Paramount Theatre. The VIP ticket included a pre-screening reception with the author, Consul General Rosalba Ojeda, the Cine Las Américas team, and supporters. A valuable evening complete with diverse culture and language, Spanish and English, tasteful bocados, and literary conversation by those supporting Ángeles Mastretta and her novel, as well as film aficionados having seen the movie during its Mexico and Spain 2008 debut, delighted to be sharing their experience of this ethnic gem. The screening was a benefit for the 13th Cine Las Américas International Film Festival, scheduled to begin April 21 and lasting through April 29. I highly recommend this international film festival to support personal cultural growth, increase in language and cultural facility, and simply as a valuable and local experience of the Other. Starring talented Ana Claudia Talancón as Catalina, enchanting Daniel Giménez Cacho, and handsome José María de Tavira, Arráncame la Vida begins its journey during a transformative period in Mexican history. The Revolution of 1910 is over and the country’s rule is open to whatever politician had the audacity to grab it. Dominating men fight ruthlessly for control, manipulating and exploiting others to gain power. Growing up in 1930s Mexico, Catalina Guzmán knows little of the world beyond her father’s house, unaware of the political storm looming over the whole country. General Andrés Ascensio is one of the iconic men who exemplifies the concept of Mexican machismo. He arrives unannounced into Catalina’s life, confidently seducing her into marriage. She follows him willingly, entranced by his power, wealth, sexuality, and the escape he offers from her provincial life. She is pushed into the tedious existence of a politician’s wife, an endless series of state dinners, public speeches, and social obligations. Despite her bravery and enduring spirit, Catalina is encaged by her marriage to Andrés, until she meets the young and vibrant Carlos Vives. The handsome orchestra director provides Catalina with her greatest desire, her greatest love, and her greatest tragedy. Most importantly, Carlos is the catalyst that transforms Catalina definitively and irrevocably. Based on the iconic novel by Ángeles Mastretta, Arráncame La Vida is the story of a young woman searching for freedom and identity during Mexico’s defining era. Talancón’s portrayal of Catalina was authentic. Women in the audience genuinely felt her wide-range of emotions, from her adolescent flirtations, to her anguished loss of love and her exulted liberation of soul. I heard the audience express caution, consolation, and questioning, all in an attempt to somehow guide Catalina in a different direction. But it’s just a movie, one might think. However, Talancón’s acting was so strong and true that it captured not only the audience’s attention, but also engaged its heart. Daniel Giménez Cacho’s energy was instantly enchanting. How can a cunning and malicious cacique be so charming? By his vigorous being did Cacho bring to life a general that could attract and mesmerize a women with an independent and strong will that was Catalina. I would be fooling myself to believe I would have been different if in Catalina’s shoes. Cacho’s performance of General Andrés Ascencio was tremendous, in every sense of the word. Absolutely tremendous! He was playful, loving, appalling, daring, and simply enticing. Bravo! The costumes–lovely and beautifully selected. As was the music; so much so, that I will be adding it to my personal collection! Truly a must read and see! Arráncame La Vida is available at Dulce Bread & Book Shop.